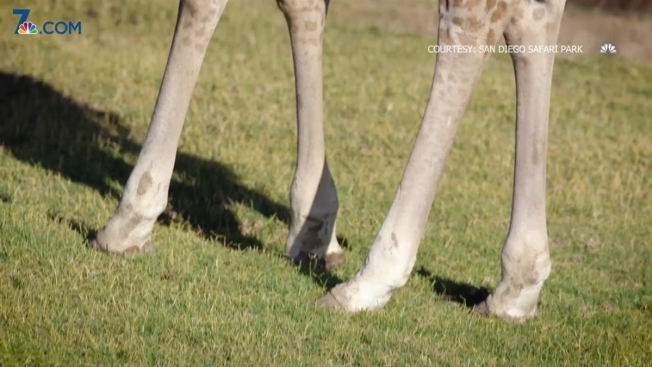 The San Diego Zoo Safari Park’s giraffe herd has grown by two in the last three weeks. Two-week-old Tamaza was born in the South Africa habitat to giraffe mom Gasira, and an unnamed calf was born a week prior in the East Africa habitat to giraffe mom Acacia, according to the San Diego Zoo Safari Park. “In just a few short weeks they’re already showing a lot of personality,” said Animal Care Supervisor Lance Aubrey. The San Diego Zoo Safari Park hosts three giraffe subspecies: Masai, Uganda and reticulated giraffes, according to the San Diego Zoo website. Researchers said the giraffe population in Africa has seen a 40 percent decrease in the last 20 years, according to a statement from the San Diego Zoo Safari Park. Last year the species was reclassified as vulnerable to extinction. A fact sheet from the San Diego Zoo Global Library states the decrease is mostly due to poaching for skin and meat, and lower reproduction rates in adult females. Other threats to the giraffe species are trophy hunting, less available food in the dry season, diseases introduced by human livestock, habitat degradation and loss of land resources due to human population growth. San Diego Zoo Global said its goal is to bring species back from the brink of extinction. “Community conservancies are where we’re seeing strong signs of hope with increasing giraffe population numbers,” said a San Diego Zoo Safari Park representative. San Diego Zoo Global researchers are looking for volunteers to help track giraffe populations in Africa, and those interested can visit wildwatchkenya.org for more information.